Not to be melodramatic, but it’s a perfectly horrid day here in southern New Hampshire. It’s raining incessantly but even though the temperature’s scraping the underside of 40 degrees, it feels a good deal colder and very raw. I braved it a little earlier to purchase a piece of salmon and the makings of a parmesan and mushroom risotto, but now that I’m home I wouldn’t go out there again for love or money. Fortunately, the love is right here inside with me. Yesterday morning was much the same, absent the rain but with the addition of an unpleasant wind. The afternoon, however, was unexpectedly clear with a warming sun, so we got out fast to do some landscaping. This is vinca minor, a lovely, tough little perennial ground cover that we’d decided we wanted in several places on the property. It can grow well in sun but does really splendidly in shade. It spreads rapidly and also holds loose soil together like a champ. Fritz had surrounded part of the old house down the hill with it, the north side in particular becoming very dense with what he’s always called myrtle. 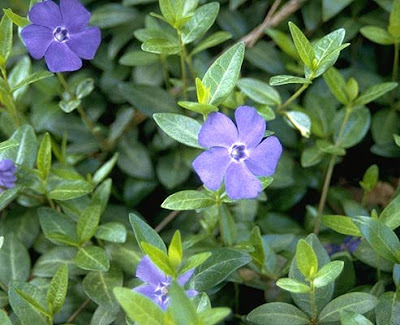 I can’t find anything that looks like it when I google Myrtle, but it’s the first thing that pops up when I google vinca. At any rate, we thinned out one section of a bank of vinca down at his old house and got it all into the ground up here before dinner last night. We still have more to do, but it was a big start and today’s ran is just what it needs to get established. There are also yellow and purple pansies in the planters across the front of the house. I want the property filled with flowers this year. 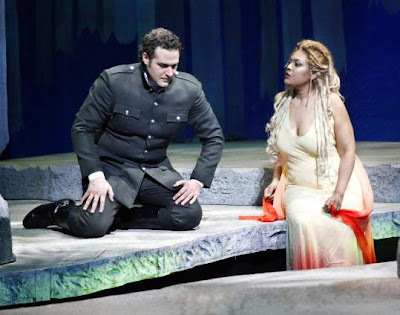 The second Rusalka of last week was a highly respectable performance in spite of a couple of wrinkles. The score sounded wonderful in the hands of conductor Ari Pelto and the Boston Lyric Opera orchestra. The level of playing in the Boston area is very high due to all the music conservatories and schools and it makes a big difference to have this kind of playing in Dvorak. The set was wonderfully atmospheric, a surround of rear projection material which dissolved forest, moon and water images in acts one and three. The act 2 palace was a cold, modern establishment that made Rusalka’s alienation perfectly plausible, but didn’t adequately support the entrance of the Water Gnome from the forest world into the human world. Costumes were variable—handsome uniforms for the men, OK dresses for Rusalka and the wood nymphs, but something that looked like hospital scrubs for the water gnome and a hideous shiny white hoop-skirted gown with an overcape for the Foreign Princess that made what seemed like a most attractive young woman look dumpy and immobile. Singing was on a good level. Marquita Lister has been singing heavy repertory and her voice is neither quite as smooth nor quite as sweet as it was but she had all the strength the role requires and managed a very well shaped Song to the Moon, the score’s most famous excerpt. She did well by the men in her life. Veteran bass John Cheek was solid and sonorous as her father the Water Gnome, and young Bryan Hymel was a fresh-voiced, ardent Prince. Nancy Maultsby was more than prepared and vocally equipped to make a meal out of the role of Jezibaba the wood witch, but suffered along with the entire cast, herself and Mr. Cheek especially, from the seeming lack of any coherent stage direction. Rochelle Bard as the Foreign Princess struggled in vain against both that awful costume and the fact that the role calls for a dramatic soprano; her light coloratura lyric voice was often swamped. But nothing could distract from the beauty and power Dvorak’s great score, and the whole the other night proved to be much greater than the sum of its parts. The maple sugar season is over for us. The sap has stopped flowing and the weather shows no sign of returning to the cold night/warm day cycle that’s needed to get it going again. Our total was three gallons, half of last year’s. YES! We've had that vinca before a time or two...and enjoyed it. Sorry your weather is not cooperating and moving on into a proper springtime. Damn it. The weather was just as dreary down here. Thanks for the tip on the vinca. I might use it as dense cover for the upper lot. Rusalka is one of my favorite Operas. Though I have seen some atrocious stagings! I concur that dress is not flattering.